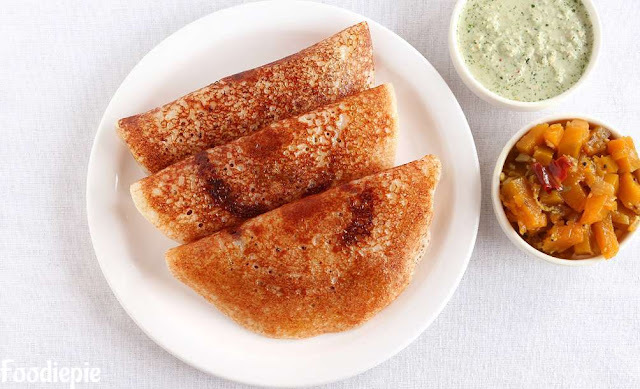 Crispy Rava Dosa Recipe - If there is something good and quick to prepare in the morning breakfast,The Rava Dosa is best option in breakfast.This is very famous Tamil Breakfast because Rava Dosa doesn't need batter to fermented overnight.This is very simple recipe. Step 1 : Put the Rava, rice flour in a big bowl, add flour also. Add one cup of water and stir until the lumps are finished, Add 1. 5 cups of water and make a thin Batter . Step 2 : Put the green chilies, ginger, green coriander, salt, asafetida, black gram and cumin seeds in the Batter.Keep Aside Batter for 15 minutes, the batter is ready to make the dosa. Step 3 : To make dosa, put nonstick tawa on the gas, lightly heat and add some oil over the tawa and spread it all around. Step 4 : Now take 2-3 teaspoon Prepared thin Dosa batter and Spread on the tawa with a spoon.Sprinkle some oil on edges of dosa and Cook dosa over high medium flame until golden brown from sides. Step 5 : Now Flip another side and cook for a minute or turns light brown. Step 6 : Dosa is completely cooked and Crispy. Transfer to serving plate. Step 7 : Prepare all the dosa from remaining batter. Step 8 : Instant Crispy Rava Dosa is Ready serve with Coconut chutney.